The temporomandibular joint has 2 unconnected cavities, superior and inferior, partitioned by the articular disc. 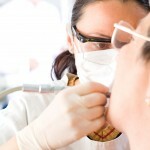 The superior space injection (SSI) of was the commonly used technique for temporomandibular disorders (TMD) . Recently, some researchers found that inferior space injection (ISI) or double spaces injection (DSI), ie, both upper and lower spaces being injected at 1time, seemed to be more effective. The aim of this review was to compare the effectiveness and safety of inferior or double temporomandibular joint spaces drug injection versus superior temporomandibular joint space injection in the treatment of temporomandibular disorders. The authors searched Medline, Cochrane Central, Embase, CBM , and World Health Organization International Clinical Trials Registry Platform electronically for randomized controlled trials comparing effect or safety of inferior or double joint spaces drug injection technique with those of superior space injection technique. In addition relevant journals as well as references of included studies were hand-searched. Risk of bias assessment with the tool recommended by Cochrane Collaboration, reporting quality assessment with CONSORT and data extraction, were carried out independently by 2 reviewers with meta-analysis being conducted using RevMan 5.0.23.
inferior or double spaces injection technique could significantly increase 2.88 mm more maximal mouth opening (P = .0001) and alleviate pain intensity in the temporomandibular area on average by 9.01 mm visual analog scale scores (P = .0001) compared with superior space injection technique. However they did not markedly change synthesized clinical index (P = .05) in the short term; nevertheless, they showed more beneficial maximal mouth opening (P = .002), pain relief (P < .0001), and synthesized clinical variable (P < .0001) in the long term than superior space injection. No serious adverse events were reported. Inferior or double temporomandibular joint spaces drug injection technique shows better effect than superior space injection technique, and their safety is affirmative. However, more high-quality studies are still needed to test and verify the evidence. Li C, Zhang Y, Lv J, Shi Z. Inferior or Double Joint Spaces Injection Versus Superior Joint Space Injection for Temporomandibular Disorders: A Systematic Review and Meta-Analysis. J Oral Maxillofac Surg. 2011 Aug 6. [Epub ahead of print] PubMed PMID: 21824703.